Find out how you can make a donation to the University of Sydney. 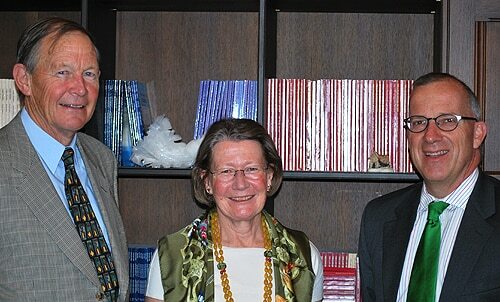 (L-R) Robert and Susan Maple-Brown with Vice-Chancellor Dr Michael Spence. A generous donation to the University of Sydney will enable further research into one of the major health problems in Australia. The gift of $5 million from the Maple-Brown Family Charitable Foundation will fund a new Colorectal Clinic at the Lifehouse Cancer Centre at Royal Prince Alfred Hospital in Sydney. The clinic will be known as the Christine Maple-Brown Clinic for Colorectal Cancer, in honour of a member of the family who died from bowel cancer at the age of 36. A scholarship for research in the field of colorectal cancer will also be established in Christine Maple-Brown's name. Colorectal cancer, or bowel cancer, is a major public health problem in this country. One in 12 Australians will develop bowel cancer in their lifetime and the disease kills around 80 Australians every week. It is the most common internal cancer to affect both men and women and is the second biggest cancer killer of Australians. "We are very pleased to be able to make this gift to the University because it will enable further important research to be carried out into this all-too-common disease," said Mr Robert Maple-Brown. "The positive news is that if colorectal cancer is diagnosed early enough, 90 percent of cases can be treated successfully," he said. One of the notable aspects about the new clinic which attracted the Maple-Brown family is that it will feature both treatment and research facilities, integrating care and support services for public and private patients. "We wanted to honour Christine's memory but also to do what we could to ensure that other patients and their families receive the best possible outcomes through the latest research," Mr Maple-Brown said. "This extremely generous donation will enable our medical experts to continue vital research in an area which is affecting growing numbers of Australians. "We are indebted to the Maple-Brown family for their support and their transformational gift. Our priority is to foster research which will really make a difference to people's lives," Dr Spence said.